“We often conclude that, as atrial fibrillation (AF) occurs with increasing frequency with advancing age in both men and women, the occurrence of AF is inevitable,” David Van Wagoner, PhD (Cleveland Clinic Foundation, Cleveland, OH) told AF Symposium News ahead of his presentation. 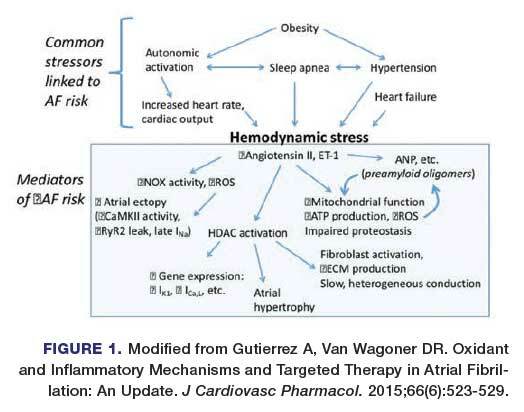 Hemodynamic stress also promotes activation of the renin-angiotensin-endothelin-1-aldosterone system. This system promotes myofibroblast activation and accumulation of interstitial fibrosis that surround the stressed and/or injured atrial myocytes. Altered and slowed conduction is common following experimental infusion of angiotensin-II as well as in hypertensive patients, obese patients, or those with sleep apnea (Figure 2). 2 Increased sympathetic nerve activity coupled with oxidation of RyR2 receptors my promote ectopy that triggers the onset of AF. Further, it is likely that the association of sleep apnea and obesity (which is both a sleep apnea and AF risk factor) is due to their impact on arrhythmia substrate changes (atrial hypertrophy and fibrosis). “From these mechanist studies, it is clear that there are novel pathways that have not yet been clinically evaluated, where targeted interventions may have a positive impact on AF risk—if we can intervene early enough,” he remarked. “With the knowledge that atrial ectopy is a powerful predictor of future AF, and improving wearable and implantable technology to monitor atrial ectopy, it seems plausible that steps toward AF prevention may be realized. During a meeting organized by the Heart Rhythm Society, a group of basic and translational scientists met to address the challenge of AF prevention—in both the primary and secondary sense. 3 Several of these are summarized in Table 1. Also important but not listed in Table 1 are the exciting approaches being pioneered by Dr. Sanders, Kalman, and colleagues in Australia 4 ; there seems to be great potential for reducing the burden of AF by implementing a greater focus on lifestyle changes that increase fitness and reduce body fat mass in a sustainable manner. Dr. Wagoner concluded: “The problem of AF is a challenging one. With an open mind and a focus on the mechanisms, there are exciting opportunities ahead." Gutierrez A, Van Wagoner DR, Mehra R. Oxidant and Infalmmatory Mechanisms and Targeted Therapy in Atrial Fibrillation: An Update. J Cardiovasc Pharmacol. 2015;66(6):523-529. Van Wagoner DR, Piccini JP, Albert CM, et al. Progress toward the prevention and treatment of atrial fibrillation: A summary of the Heart Rhythm Society Research Forum on the Treatment and Prevention of Atrial Fibrillation, Washington, DC, December 9-10, 2013. Heart Rhythm. 2015; 12(1):e5-e29.